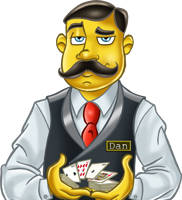 About Dealer Dan - Casino Answers! I’m Dealer Dan, the main “Casino Answers Man” here at CasinoAnswers.com. I’m the one that answers the majority of the questions that are submitted to CasinoAnswers.com. I was born on January 23, 1981. I’m married with two kids, and my whole life is consumed with gambling. I’ve did everything you can think of when it comes to gambling. On the player side of things, I’m both a professional poker player and professional sports bettor. I’ve also casino bonus whored and bingo bonus whored online, and have covered everything from a player perspective. From the owners side of things, I’ve been a majority shareholder in some online casinos and poker rooms, and have assisted many startups when they were launching their properties. I’m also an affiliate – which basically means I’m the “marketing department” of many online gambling properties. This means I know what works, and what you guys want, and am able to get you the best deals possible. That’s why we have the exclusive VIP Club. Throughout the years, I’ve learnt pretty much everything there is to know about gambling, and I’m proud to be able to run CasinoAnswers.com, and pass on everything that I have learned over the years.